Exclusive First Listen: Vijay Iyer Trio, 'Historicity' Iyer's new album is the work of a piano trio playing mostly covers — a common sight in jazz. To anyone paying attention to these sounds, which draw from visionaries as diverse as Andrew Hill and M.I.A., it's readily evident that his is an uncommon, even daring approach. Hear the record, Historicity, in its entirety for the week preceding its Oct. 13 U.S. release. Hear and download a full recording of the Vijay Iyer trio performing songs from Historicity live in concert, captured at the 2009 Newport Jazz Festival. Audio for this feature is no longer available. The album was released on Oct. 13, 2009. 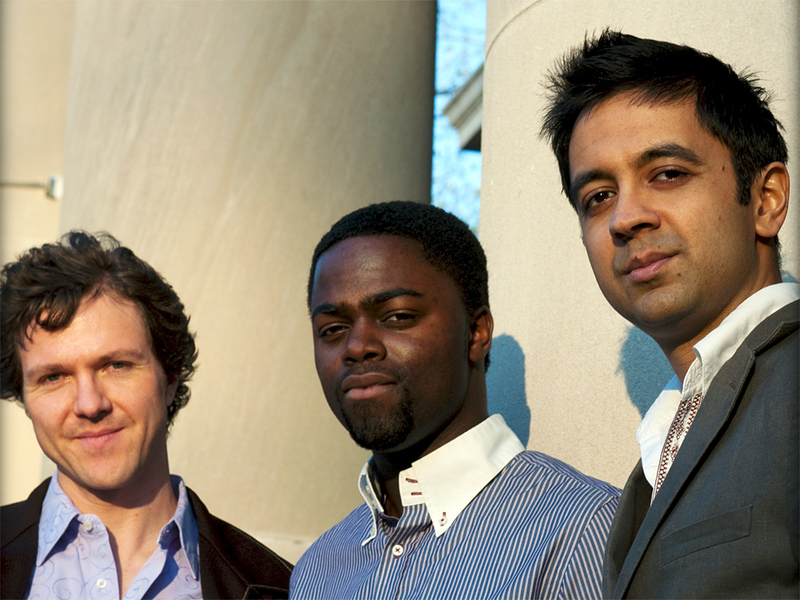 The Vijay Iyer trio (L-R): Stephan Crump, Marcus Gilmore, Vijay Iyer. Vijay Iyer's new album, Historicity, is the work of a piano trio playing mostly covers — a common sight in jazz. But to anyone paying attention to these sounds, it's evident that the band is taking an uncommon, even daring approach. The repertoire comes from luminaries around the music world, including jazz visionaries Andrew Hill ("Smoke Stack") and Julius Hemphill ("Dogon A.D."). It also features a dark Stevie Wonder lament cloaked as a joyous blues ("Big Brother"), a love song from West Side Story inverted ("Somewhere"), a tune best known as a sample for A Tribe Called Quest ("Mystic Brew") and, of course, M.I.A. 's breakout electro-pop banger "Galang." Several spiky originals, some of which revise early Iyer compositions, bookend the record. But interpretation isn't strong enough a description for what's going on here. Iyer's approach to re-imagining the familiar is a deliberate collision with his group's existing sonic language. Perhaps as a result of being largely self-taught, Iyer has developed a distinctive textural mastery of the piano. With him here are bassist Stephan Crump, who provides a riveting anchor, and drummer Marcus Gilmore, whose advanced rhythmic understanding appears effortless. Iyer might also say that this music is informed by the histories of its performers. For Iyer himself — son of Indian immigrants, interdisciplinary Ph.D. graduate from Berkeley — that history is one of unconventional thought. His liner notes reference Antonio Gramsci, the psychological perception of time and "everyday life in transcultural New York City." In pushing itself to explore so many different creative founts on Historicity, the Vijay Iyer trio offers just as many points of entry for new fans. But set aside for a second the philosophical framework, the 11/8 time signatures (do check out Gilmore on "Dogon A.D." though), the multiplex sonic goulash. The truly astonishing thing about these three musicians is that they make challenging music sound immediately enjoyable.